Product Dimensions (L x W x H): 19.5" x 7" x 18"
Our HMS Victory model has a dimension of 21 x 7 x 18. 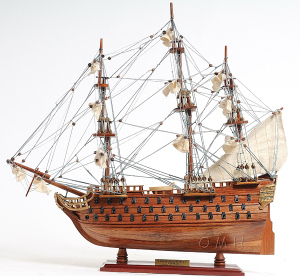 It is a smaller scale version of a much larger version such as the HMS Victory 36 and the 56. Our model is handcrafted from beautiful wood such as rosewood, mahogany, teak, and along with various other exotic wood. The hull is constructed using a plank on frame method, each strip of exotic wood are carefully join together to form a smooth hull. This model is completely hand built to spec by skillful and creative master craftsmen; you will be amazed at how real it looks. The ship has a clear varnished coating follow with amazing details. On the ship, you will spot amazing details such as: wooden bowsprit, foremast, mainmast, and mizzen mast. They are all connected to numerous fabric sails with detailed stitching, all rigging are painstakingly fastened by hand in matching colors. Theres a small wooden cabin with a wooden boat on the main deck. On the quarter deck, theres a wooden cabin. There are wooden fences surrounding the beakdeck area toward the quarter deck area. You can easily spot a large number of metal cannons on both side of the hull, and other crafted metal parts on the front and back of the ship. Theres also a wooden rudder to help the ship maneuver in the right direction. An attached wooden stand with a nameplate engraved HMS Victory 1805 is standard on this model. Our model was built according to scale through original plans, pictures and drawings. We absolutely use no plastic parts only the highest quality wood and metal parts. This model is carefully secure and packed inside a wooden crate for easy shipping purposes. Our HMS Victory model comes fully-assembled and ready to be display. The H.M.S. Victory was the ultimate British fighting vessel: a full rigged 227 feet long ship with 104 guns and 850 men when at full capacity. It is able to move from 15 to 17 kilometers per hour, and weighed as heavy as 7 tons, including guns. It was launched in 1765 and was most famous as Admiral Horatio Nelson's flagship at the Battle of Trafalgar in 1805. Nelson was shot and killed during the battle. H.M.S. Victory is the oldest naval ship still in commission. It has been restored and rests in a dry dock at Portsmouth, England. The ship in Portsmouth is the sixth ship with the name Victory in the Royal Navy. There has been great interest in the fifth Victory ship, which was built 15 years earlier and whose wreckage was found recently by Odyssey Marine Exploration.